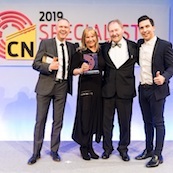 A1 Flue Systems has been named Specialist Contractor of the Year 2019 at the Construction News Specialist Awards. Our Directors Colin and Janice Moir were on hand to pick up the award at the event which was held at JW Marriott Grosvenor House Hotel onPark Lane in London. Colin, who founded the business in 1972, was delighted to scoop such a prestigious award as it reflects the company’s growth to become UK market leaders in the design, manufacture, installation and maintenance of commercial and industrial chimney, flue and exhaust systems. He praised the 140-strong team based at our factory in Ollerton for their effort, commitment and dedication in cementing our market-leading position as the best British manufacturer of flues and chimneys. “This is such a huge honour for our company, and everyone at A1 deserves to share the recognition that this brings for a family business that has grown to become a great example of British engineering and manufacture at its best,” said Colin. Giving feedback on why we won the award, the judges said they were really impressed with how the next generation of family business A1 Flue Systems had “completed the loop” in the firm’s offering by adding a completely new service, Commercial Flue Cleaning and Maintenance Services Ltd. It was fitting praise for a firm that prides itself on the design, manufacture and installation of bespoke commercial and industrial chimney, flue and exhaust systems, as well as natural ventilation and lighting. The judging panel noted that the business stood out in this incredibly strong category, which proved a tough one to judge. They described all of the shortlisted companies as worthy finalists, but what differentiated A1 Flue Systems from the others was the way in which the 47-year-old business had modernised. The panel highlighted our “very impressive” work on the Battersea Power Stationchimneys, which it described as being part of an “outstanding portfolio of projects”. They also noted that we sought to innovate, and cited the development of an in-house capability to conduct studies that predict the dispersion of combustion exhausts from commercial chimneys, for which we used the same software as Formula 1 racing teams. Judges also praised our approach to both diversity and training, and noted our strong commercials as a key factor in the win. “It is flying the flag for British manufacturing while demonstrating an impressive approach to both inclusion and diversity,” the panel said. The Specialist Contractor category in the Construction News Specialist Awardswas sponsored by Careys.